It's time to get excited Imagine Dragons fans! 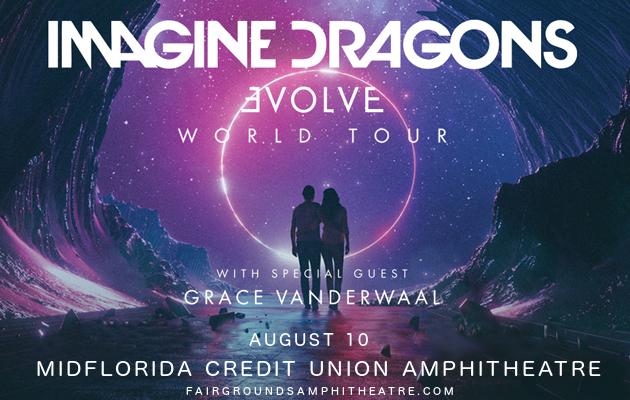 They’re coming LIVE at MidFlorida Credit Union Amphitheatre on Friday 10th August 2018 with their stunning new album, “Evolve”! Joining them on the road is the phenomenal 14-year old songwriter Grace VanderWaal. Get your tickets today – hit the “Buy Tickets” button above! Get ready to experience all Imagine Dragon’s fresh new sounds live in a concert that will undoubtedly be one of the greatest you’ve ever seen! What are you waiting for?? Get your tickets NOW!